For the soul there is neither birth nor death at any time. He has not come into being, does not come into being, and will not come into being. He is unborn, eternal, ever-existing, and primeval He is not slain when the body is slain. Indeed, the dominant ideology of the West, material science, has for several centuries stifled any serious or widespread interest in the preexistence and survival of consciousness beyond the present body. But throughout Western history, there have always been thinkers who have understood and affirmed the immortality of consciousness and transmigration of the soul. And a multitude of philosophers, authors, artists, scientists, and politicians have given the idea thoughtful consideration. Among the ancient Greeks, Socrates, Pythagoras, and Plato may be numbered among those who made reincarnation an integral part of their teachings. At the end of his life, Socrates said, “I am confident that there truly is such a thing as living again, and that the living spring from the dead.”2 Pythagoras claimed he could remember his past lives, and Plato presented detailed accounts of reincarnation in his major works. Briefly, he held that the pure soul falls from the plane of absolute reality because of sensual desire and then takes on a physical body. First, the fallen souls take birth in human forms, the highest of which is that of the philosopher, who strives for higher knowledge. If his knowledge becomes perfect, the philosopher can return to an eternal existence. But if he becomes hopelessly entangled in material desires, he descends into the animal species of lite. Plato believed that gluttons and drunkards may become asses in future lives, violent and unjust people may take birth as wolves and hawks, and blind followers of social convention may become bees or ants. After some time, the soul again attains the human form and another chance to achieve liberation.3 Some scholars believe that Plato and other early Greek philosophers derived their knowledge of reincarnation from mystery religions like Orphism, or from India. Death. Man’s most mysterious, relentless, and inevitable adversary. Does death mean the end of life, or does it merely open the door to another life, another dimension, or another world? If man’s consciousness survives the death experience, then what determines its transition to new realities? In order to gain a clear understanding of these mysteries, man has traditionally turned to enlightened philosophers, accepting their teachings as representative of a higher truth. But when man endeavors to understand something beyond the scope of the material senses, beyond instruments of measurement and the faculty of mental speculation, then there is no alternative but to approach a higher source of knowledge. No scientist has successfully explained through laboratory investigations the mystery of consciousness or its destination after the destruction of the material body. Research in this field has produced many divergent theories, but their limitations must be recognized. The systematic principles of reincarnation, on the other hand, comprehensively explain the subtle laws governing our past, present, and future lives. If one is to understand reincarnation at all, he must acknowledge the fundamental concept of consciousness as an energy distinct from and superior to the matter composing the physical body. This principle is supported by examination of the unique thinking, feeling, and willing capacities of the human being. Can DNA strands or other genetic components possibly induce the feelings of love and respect one person has for another? What atom or molecule is responsible for the subtle artistic nuances in Shakespeare’s Hamlet or Bach’s “Mass in B Minor”? Man and his infinite capabilities cannot be explained by mere atoms and molecules. Einstein, the father of modern physics, admitted that consciousness could not be adequately described in terms of physical phenomena.“I believe that the present fashion of applying the axioms of science to human life is not only entirely a mistake, but also has something reprehensible in it,” the great scientist once said. Further recognition of the unique properties of consciousness was given by Nobel laureate in physic Niels Bohr, who remarked, “We can admittedly find nothing in physics or chemistry that has even a remote bearing on consciousness. Yet all of us know there is such a thing as consciousness, simply because we have it ourselves. Hence consciousness must be part of nature, or, more generally, of reality, which means that quite apart from the laws of physics and chemistry, as laid down in quantum theory, we must also consider laws of quite a different kind.” Such laws might well include the laws of reincarnation, which govern the passage of consciousness from one physical body into another. To begin understanding these laws, we may note that reincarnation is not an alien, antipodal event, but one that occurs with regularity in our own bodies during this very lifetime. In The Human Brain, Professor John Pfeiffer notes, “Your body does not contain a single one of the molecules that it contained seven years ago." Every seven years one’s old body is completely rejuvenated. The self, however, our real identity, remains unchanged. Our bodies grow from infancy, to youth, to middle age, and then to old age, yet the person within the body, the “I,” always remains the same. Reincarnation—based on the principle of a conscious self independent of its physical body—is part of a higher-order system governing the living being’s transmigration from one material form to another. Since reincarnation deals with our most essential selves, it is a subject of the utmost relevance to everyone. 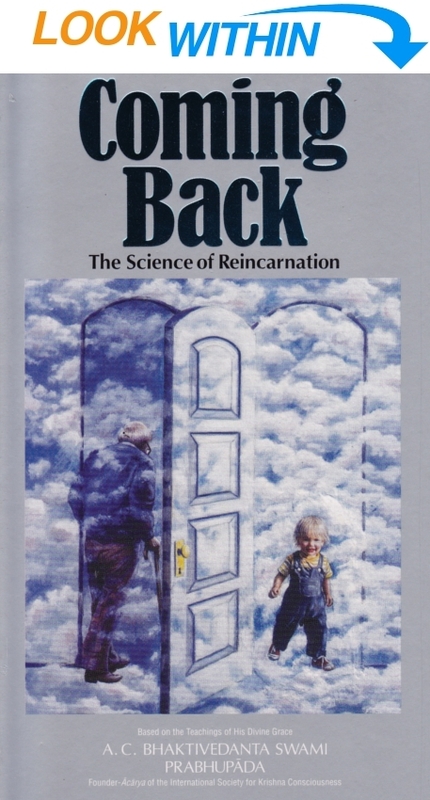 Coming Back explains the fundamentals of reincarnation presented in the timeless Vedic text Bhagavad-gita. The Gita, thousands of years older than the Dead Sea Scrolls, provides the most complete explanation of reincarnation available anywhere. It has been studied for millennia by many of the world’s greatest thinkers, and since spiritual knowledge is eternally true and does not change with each new scientific theory, it is still relevant today. In this age of global uncertainty, it is imperative that we understand the real origin of our conscious selves, how we find ourselves in different bodies and conditions of life, and what our destinations will be at the time of death. This essential information is comprehensively explained in Coming Back. Chapter One shows how reincarnation has profoundly influenced many of the world’s greatest philosophers, poets, and artists, from Socrates to Salinger. Next, the process of reincarnation as expounded in Bhagavad-gita, the oldest and most respected sourcebook on the subject of transmigration of the soul, is presented. Chapter Two, a lively dialogue between His Divine Grace A.C. Bhaktivedanta Swami Prabhupada and noted religious psychologist Professor Karlfried Graf von Durckheim, clearly shows how the material body and the antimaterial particle, the spirit soul, can never be the same. In Chapter Three, a famous heart surgeon urges systematic research into the soul, and Srila Prabhupada cites the Vedic version, thousands of years older and strikingly more informative than modern medical science. Three fascinating narratives from the Vedic text Srimad-Bhagavatam constitute Chapter Four. These accounts stand as classic examples of how the soul transmigrates through different types of bodies under the control of the precise laws of nature and karma. In Chapter Five, excerpts from the writings of Srila Prabhupada clearly demonstrate that the principles of reincarnation can be easily understood in terms of ordinary events and common observations that regularly occur in our daily lives. The next chapter describes how reincarnation embodies a universal and infallible system of justice, wherein the soul is never banished to eternal damnation but is constitutionally endowed with a permanent opportunity to escape the perpetual cycle of birth and death. Common misconceptions and chic notions about reincarnation form the subject of Chapter Seven, and the concluding chapter, “Don’t Come Back,” presents the process through which the soul can transcend reincarnation and enter realms in which it is finally freed from the prison of the material body. Having once achieved this status, the soul never again returns to this endlessly mutable world of birth, disease, old age, and death. We were behaving like we were going to live forever, which is what everyone thought in the Beatles days, right? I mean, whoever thought we were going to die? If you want to gain real control over your destiny, you must understand reincarnation and how it works. It’s that simple. No one wants to die. Most of us would like to live forever in full vigor, without wrinkles, gray hair, or arthritis. This is natural, because the first and most basic principle of life is to enjoy. If we could only enjoy life forever! Most of us seldom, if ever, think about death or what happens afterward. Some say that death is the end of everything. Some believe in heaven and hell. Still others hold that this life is only one of many we have lived and will live in the future. And more than one third of the world’s population—over 1.5 billion people—accept reincarnation as an irrevocable fact of life. Reincarnation is not a “belief system”–or a psychological device for escaping the “grim finality” of death, but a precise science that explains our past and future lives. Many books have been written on the subject, usually based on hypnotic regression, near-death experiences, accounts of out-of-body experiences, or deja-vu. But most reincarnation literature is poorly informed, highly speculative, superficial, and inconclusive. Some books purport to document cases of people who, under hypnosis, have been regressed to previous lifetimes. They describe in detail houses they lived in, streets they walked on, parks they frequented as children, and the names of their former parents, friends, and relatives. All this makes for interesting reading, and while such books have certainly stimulated the ever widening public interest and belief in reincarnation, careful investigations have revealed that many of these so-called past-life regression cases are rife with guesswork, inaccuracies, and even fraud. But most importantly, none of these popular works explain the fundamental facts about reincarnation, like the simple process by which the soul eternally transmigrates from one material body to another. In rare instances when basic principles are discussed, authors generally present their own theories about how and in which particular cases reincarnation occurs, as if some special or gifted living beings reincarnate and others do not. This type of presentation does not deal with the science of reincarnation but introduces, instead, a confusing array of fabrications and contradictions, leaving the reader with scores of unanswered questions. For example: Does one reincarnate instantaneously or slowly, over a long period of time? Can other living beings, like animals, reincarnate in human bodies? Can man appear as an animal? If so, how and why? Do we reincarnate forever, or does it end somewhere? Can the soul suffer perpetually in hell or enjoy forever in heaven? Can we control our future incarnations? How? Can we be reborn on other planets or in other universes? Do good and evil actions play a role in determining our next body? What is the relationship between karma and reincarnation? Coming Back fully answers these questions, because it scientifically explains the true nature of reincarnation. Finally, this book provides the reader with practical instructions on how to come to grips with and rise above the mysterious and generally misunderstood phenomenon of reincarnation—a reality that plays a vital role in shaping man’s destiny. Coming Back answers these most profound and mysterious of all questions by presenting clear and complete explanations from the world’s most authentic, timeless sources of knowledge about afterlife.